Lament and Chant - In Memoriam is dedicated to all those who have suffered as a result of the wars in Iraq and Afghanistan. 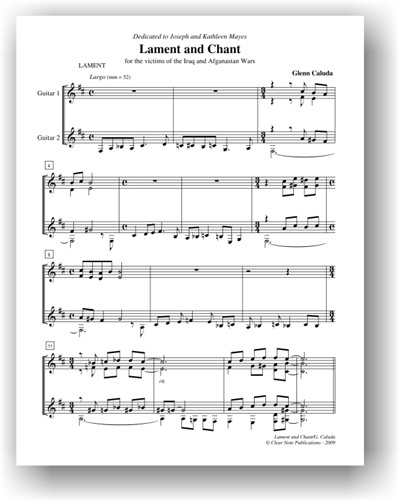 The musical material of the piece is based on the Lux Aeterna (eternal light) chant from the Gregorian Requiem Mass. The Waltz is a mutation of the chant and the Lament is freely composed. The music moves through sadness and chaos, but ultimately, it is a testament to the triumph of eternity over tragedy. 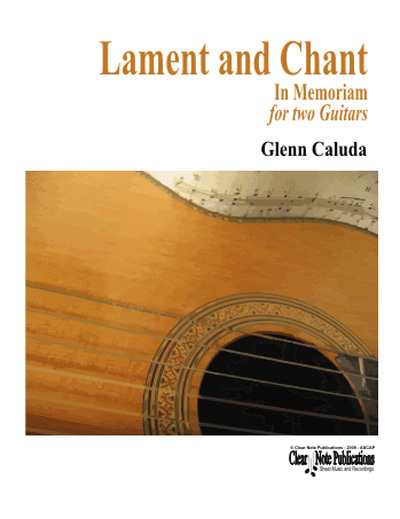 Glenn Caluda was born in New Orleans, Louisiana and received a Bachelor of Music Education degree from Louisiana State University in Baton Rouge. From 1970-1973, he served as guitarist and bassist with the Soldiers' Chorus of the United States Army Field Band of Washington, DC. After military service, Mr. Caluda taught guitar at the Community College of Baltimore. He attended the University of Maryland and received a master of Arts degree in Music Education. In 1975, he became the first full time guitar teacher at Shenandoah College and Conservatory (now Shenandoah University) in Winchester, Virginia, where he has established a classical guitar program and added new curricula. He received a Ph.D. in Music Education from Louisiana State University in 1985. Mr. Caluda studied guitar with the renowned guitar pedagogue Aaron Shearer as well as other fine teachers and players. He has given classes and clinics at various state and national music educators' conventions. His publications include journal articles, compositions for solo guitar, arrangements for guitar ensemble, and music for children's choir. Mr. Caluda is also an active performer as a soloist and in various ensembles.